From the time I was a small child growing up in a religion rich with liturgical smells and bells, church had been a place where I experienced a sense of God. There, the scent of incense lingering in the air consoled and the candle that flickered day and night in a red glass lamp served as a soothing sign of the divine presence. All that was altered, however, with the death of my parents. Church suddenly became a place of sad memories: of pushing my mother’s wheelchair in and then struggling to get her to the basement bathroom mid-service. Or of beginning to notice how gray my father’s skin was looking against that of others beside him as his condition worsened. Brunera, top, and Woodland Phlox in bloom. After my parents died within a year and a half of each other, I wasn’t angry at God, but church was simply not the place of peace it had been for me in other seasons. I continued going there in this extended state of grief and spiritual numbness, knowing that it was important to maintain a connection to my faith at such a time, but I was surprised to find more tangible comfort in a new place: my garden. I had been something of a gardener since marriage eight years earlier had brought with it an acre of unwieldy property peppered with huge pine trees and assorted nooks and crannies that seemed to be begging for attention. But now, I started to attack the dirt with new energy. One day, I noticed that a gentle peace I had not felt for months would settle upon me as I weeded, dug, and watered. I began to go back for more. Over time, I would not only sense a comforting presence in the garden, but through the growing cycle, I would glean practical spiritual lessons from tending a troublesome plant or discovering the dangers of admitting invasive varieties into my space. 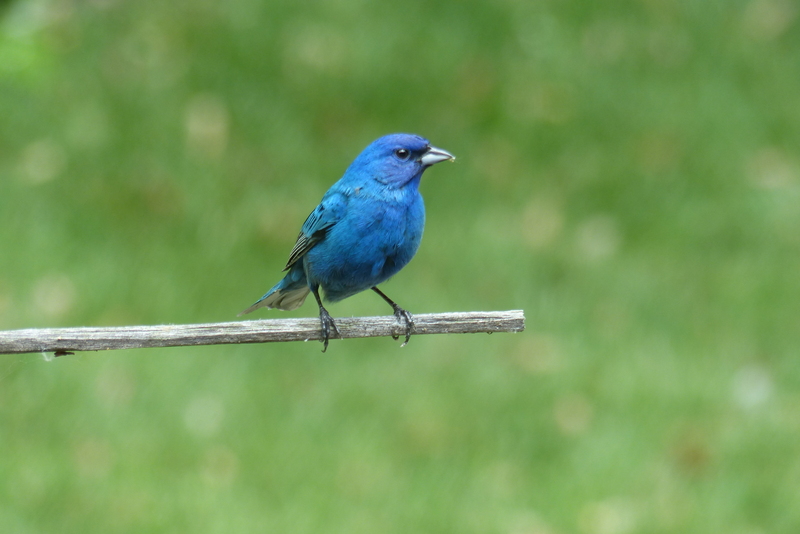 A male Indigo Bunting, known to sing all day. I eventually recovered a sense of peace while being in church as memories from that difficult period of loss healed. But I have continued to find solace in the garden, as I know many gardeners do. Perhaps it is because the act of working with our hands frees our minds to listen to a voice that speaks in whispers, in “the kiss of the sun” and “song of the birds,” as Dorothy Frances Gurney says so nicely in the above excerpt from her longer poem, “God’s Garden.” I discovered Gurney’s lines on a decorative plaque as I was venturing into gardening and warmed to them immediately. The words come home to me again and again as I take in bird song and bask in the sun, pausing to consider the richness of my surroundings. I sometimes think of deceased family members who were gardeners – my husband’s Uncle Bill, to whom my patch of Bee Balm stands in silent tribute; my paternal grandmother, who planted snap dragons with her vegetables, and my father, who left me two precious garden tools from his years of growing a small patch of onions, peppers, tomatoes, and garlic, likely as a holdover from the Great Depression. I understand better now what drew all of them to the dirt and why they seemed so contented when they were communing with the growing cycle. Bee Balm, introduced to me by my husband’s Uncle Bill and a favorite of hummingbirds. Although the words Gurney wrote about gardening were inspired by a very proper English garden at Penshurst Place in Kent, and my own garden is decidedly on the wild side, their sentiments speak to me whether I am reflecting on the beauty of things in bloom or cultivating their home. Recently, a friend who was surveying my garden when it was much in need of a spring cleaning asked, “Do you ever just get to sit and enjoy this, or are you always working on it?” I do have time to rest on the front porch or stroll through and gaze at the fruits of my labors, but I also am much at peace while planting and pulling weeds. There are exceptions, of course, like when I’m being buzzed by a deer fly or mosquito, dig into a colony of ants, or pick the most humid day of the year for mulching. But on most of the grand days of the growing season, those are mere distractions in what to me is still a refuge, a place where I listen and God speaks.